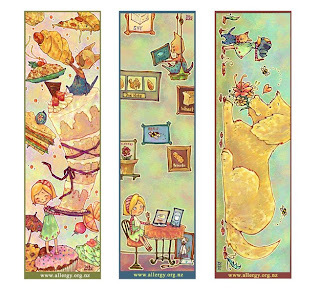 I was kindly asked by Inga Stunzner, the Information Officer at Allergy New Zealand, to design a series of Bookmarks to promote their organization. 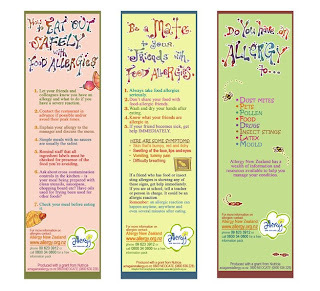 This was a really fulfilling project, and "The bookmarks, sponsored by Nutricia, will be distributed to over 50 community and school libraries around the country, which are holding allergy displays." The bookmarks are being launched ... NOW! along with other resources during the Allergy Awareness Week (17th-23rd May) aiming to educate the food service industry.